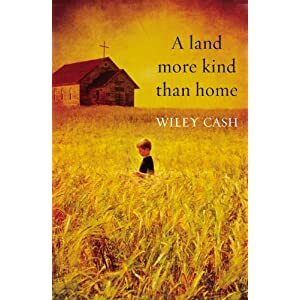 Born in North Carolina, raised in an evangelical church, Wiley Cash draws on his own personal experiences to produce this impressive debut novel. One Sunday, in the oppressive Summer heat, the congregation of River Road Church take their religious fervour one step too far with devastating consequences. This compelling story, set in Madison County in 1986, is narrated from the perspectives of three different characters – Jess Hall, nine year old brother to Christopher “Stump” whose autism hinders any verbal communication, Clem Barefield, Sheriff of Madison County for 25 years yet still considered an outsider and finally, Adelaide Lyle, elderly spinster who leads the Sunday School yet remains wary of the Pastor, Carson Chambliss. Chambliss is a very shady character, one of those larger than life, mesmerizing preachers who rules his ingenuous congregation with a rod of iron as well as traumatising them with snakes, poison and fire – blind faith indeed… This may be the 80s but this could be the land that time forgot. There’s a great sense of place as the narrative moves from present to past and back again, evoking the seasons and landscape of this timeless setting. The author also seems very much in tune with his characters, ordinary, down to earth folk who try to get by the best they can – with perhaps one glaring exception. If you enjoy well told stories with that languid, laconic vibe you find in the best Southern fiction, you will relish this gripping, poignant tale. Looking forward to hearing more from Madison County in Wiley Cash’s future novels. This entry was posted on Monday, January 23rd, 2012 at 9:07 am	and is filed under American Fiction. You can follow any responses to this entry through the RSS 2.0 feed. You can leave a response, or trackback from your own site. I like my fantasy moments too, Stu but it’s such a good feeling when an author gets the sense of place spot on.